There was a remarkable result in the 500 metre event of the 2019 World Junior Speed Skating Championship which took place in Baselga Di Piné, Italy, last Friday – a single club claimed all three podium places! Gold, Silver and Bronze medals went to skaters from the Dutch club Gewest Fryslan; and the stars of the show were Femke Beuling (Gold); Femke Kok (Silver) and Michelle de Jong (Bronze). The Netherlands began the competition as favourites to win the Ladies’ heats and certainly didn’t disappoint in that event – denying all other countries a place on the podium! Nineteen year old Femke Beuling is riding particularly high – in achieving first place she has also recorded a personal fastest-time of 38.38 seconds for the 500 metre distance. At these energy-bursting events split-second timing is everything and all three winners crossed the line with less than half a second between them: Eighteen year old Femke Kok coming in 0.25 seconds later to claim silver; and nineteen year old Michelle De Jong 0.16 seconds after that. The 500 metre race is so quick that even when you are ahead you never really know you will win until you cross the finish line – so says Gold medallist Femke Beuling; ‘…the most dangerous part of the race is going into the second corner …you are at full speed and need to get the right line – so you don’t have time to think of anything else anyway’. She says she has never heard of three contestants from the same club taking all three spots on the podium in an international competition – but what makes the achievement even more special is that the 500 metre event isn’t one to which the Dutch teams, historically, contribute particularly notable performances, she explains. It’s in the longer events that the Dutch are feared. Dutch Junior speed skaters are a formidable force: since Junior Speed Skating (under 21) became an international sport in 1974 the Netherlands have taken 77 Gold medals competing alongside 20 Nations. 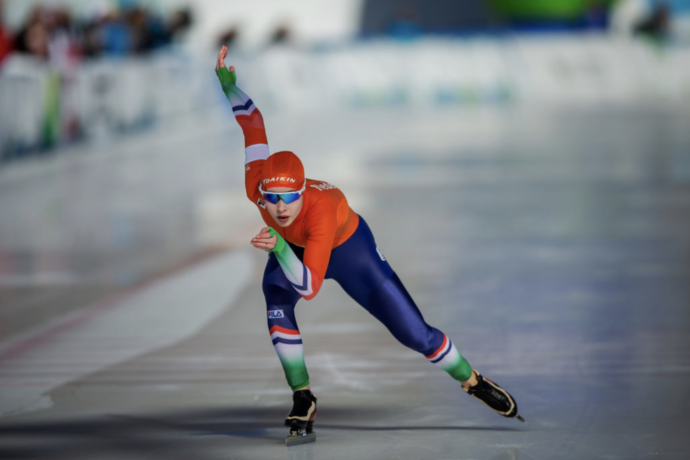 The careers of these young skaters is shaping up nicely – Michelle De Jong went on to win the 1000 metre event the following day, with Femke Kok gliding into second place less than half a second behind. And as if to prove Femke Beuling right about Dutch success with the longer distances – in the 1500 metre event Femke Kok took first place. Neither was that Femke Kok’s first gold in the 1500: just three months ago, attending her first ever big event – the World Cup for Juniors in Poland – she returned with three gold medals, winning the 1000m; 1500m; and Team Sprint events. Our applause cannot pass without acknowledging the work of trainer/coach Wouter van der Ploeg – who accompanied the contestants to Italy and witnessed their win – and also all the hard-working staff at Gewest Fryslan. Victron Energy sponsors the skating club Gewest Fryslan – where Beuling, Kok and De Jong train – and here at Victron we are all very proud of their performance. Wouter has also provided us with the photograph from the podium. Thank you.